DEER HAVEN - Private Hot Tub with Screened In Porch & Gorgeous Seasonal Views! 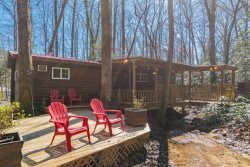 Located only 5 miles from Helen, Ga. Serenity Cellars & Vineyard is a very short drive down the road that this cabin is on. Serenity Cellars is a comfortable & cozy facility that features lively music & wine tasting 7 days a week with vineyards on premise. This beautiful cabin has just been renovated & upgraded! Looks brand new inside & out. Enjoy the hot tub in total tranquility or Relax on the screened in porch or by the fire pit! The Smart TVs will give you all the video streaming options you need. Play a game of Pool or Foosball, or play the board games provided to guests but the owner. You will not want to leave this cabin! But, if you feel like getting out and doing something fun then come and fish in our Stocked Trout Pond located in the Blue Creek Resort, which is only 4 miles from your cabin. There you can also enjoy nature trails and private garden tours! And, last but not least, take time & enjoy all that the charming town of Helen, Ga has to offer. The road to this cabin is all paved. The maximum number of vehicles in the driveway is 3. Min. AGE of primary renter: 25 Years Old. Firewood is available for delivery. 3 bundles for $24.00. Ask the office! Smart TV: Access Netflix, Pandora etc. Pool Table, Foosball Table, Board Games provided. Stocked Fishing Pond Package: $39.95 for up to 10 trout.